Drivers across Oregon are succumbing to a national trend of driving while distracted. Eating, drinking, attending to pets or children—there are some many things that can divert a driver’s attention from the road. Lately, technology has become an increasingly widespread problem for drivers. Navigation and entertainment systems in vehicles contribute to this problem, but the most obvious culprit is the ubiquitous smart phone. Mobile phone manufacturers are attempting to address this problem by improving and enhancing “do not disturb” features on smart phones. Apple has been at the head of this trend. Business Insider reports that the iOS 11 operating system for iPhone—due for release in late 2017—will include a comprehensive “do not disturb while driving” function. This function will detect when a user is driving and automatically engage itself. The user receives no notifications and cannot access the home screen until he or she stops driving. The user can override this setting by following a series of prompts. While this override feature is necessary in the event that a user is the passenger in a vehicle, it leaves open the possibility that drivers can override the feature and still be able to use their smart phones while driving. Who is Responsible for Distracted Driving? Do Not Disturb features raise a broader discussion into the issue of distracted driving. Distracted driving is responsible for thousands of deaths and injuries every year. In fact, Apple’s move to introduce the comprehensive function for iOS 11 comes after it was sued for failing to include such features in earlier versions. According to the Guardian, Bethany and James Modisette sued Apple for the wrongful death of their five-year-old daughter, who was killed in a car accident by a driver using FaceTime while driving. The Modisettes alleged that Apple held patents on technology to lock out iPhone functions while driving, but had failed to implement them in their products, thus contributing to their daughter’s death. While the implementation of Do Not Disturb features can certainly help target the problem, each individual driver must accept personal responsibility for practicing safe driving habits. No technology can completely eradicate the dangers of distracted driving. No Do Not Disturb feature can be forcefully implemented in every driving situation. Only a personal commitment to avoiding distractions can prevent someone from becoming distracted. Passengers should speak up when they notice their driver is becoming distracted. Parents should enforce specific guidelines for their teen drivers, whose inexperience makes distracted driving particularly dangerous. 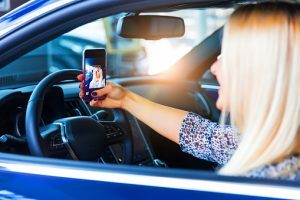 Just a few weeks ago, lawmakers in Oregon passed a strict new hands-free law that prohibits all drivers from touching their phones—or any electronic mobile device—while operating a motor vehicle. House Bill 2597 was approved by both the House and Senate and is expected to be signed by the governor. Language in the new statute will make it easier to cite and convict drivers of distraction. Historically, many such cases have been dismissed because the law requires police officers to actually see your fingers moving or your mouth talking into the phone in order to issue a citation. A one-time citation can be erased from your record by taking a safe driving course. However, if you are cited twice in 10 years, you face a maximum fine of $2,000. A third time citation will be accompanied by that same maximum fine, but also possible jail time. Car accident victims throughout Oregon and Washington trust the attorneys at Zbinden & Curtis to secure full and fair compensation for injuries sustained in a car accident due to distracted driving or any other form of negligence. Zbinden & Curtis protects victims and holds negligent drivers responsible so that the roads of Portland are safer for everyone.